Kresge, Stanley S. & Steve Spilos. 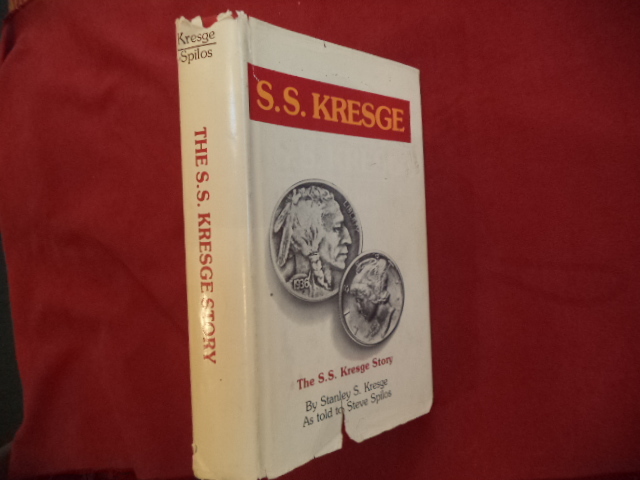 The S.S. Kresge Story. Photo available. Racine. Western Publishing. 1979. 373 pps. Octavo. Hardcover. First edition. Illustrated. Important reference work. Fine copy in edge chipped dust jacket (in mylar). Kreuzer, Anton. Omega Designs. Feast for the Eyes. With Values. Watches. Photo available. Atglen. Schiffer Pub. 1996. 225 pps. 4to. Hardcover. First edition. Illustrated in black, white and color. Important reference work. Fine copy (name on end paper) in near fine (very light edge wear) dust jacket (in mylar). 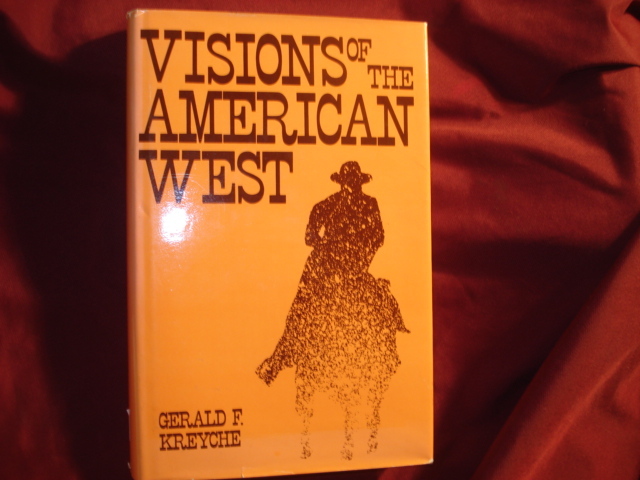 Kreyche, Gerald F. Visions of the American West. Inscribed by the author. Photo available. np. University of Kentucky Press. 1989. Octavo. Hard cover. First edition. Illustrated. Inscribed by the author. Fine copy in fine dust jacket (in mylar). Krieger, Herman. Churches ad Hoc. A Divine Comedy. Eugene. Photozone. 1998. 86 pps. Octavo. Soft cover. First edition. Illustrated. Fine copy. Light stain rear edge. Kring, Walter Donald. Liberals Among the Orthodox. Unitarian Beginnings in New York City, 1819-1839. Photo available. Boston. Beacon Press. 1974. Octavo. Hard cover. First edition. Illustrated. Fine copy in near fine (very light shelf wear) dust jacket (in mylar). Krishnamurti, J. Krishnamurti to Himself. His Last Journal. Photo available. Cambridge. Harper & Row. 1987. 134 pps. Octavo. Hardcover. First edition. Full number line. Important reference work. Fine copy in fine (spine lightly faded) dust jacket (in mylar). Kronenberger, Louis. Kings and Desperate Men. Life in Eighteenth-Century England. New York. Vintage. 1959. 306 pps. Octavo. Soft cover. First edition thus. Fine copy. Kruger, Anna. An Illustrated Guide to Herbs Their Medicine and Magic. Limpsfield. Dragon's World. 1993. 4to. Hard cover. First edition. Illustrated in color and black & white. Fine copy in fine dust jacket (in mylar). Kruger, Anna. An Illustrated Guide to Herbs Their Medicine and Magic. Photo available. Limpsfield. Dragon's World. 1993. 4to. Hard cover. First edition. Illustrated in color and black & white. Fine copy in fine dust jacket (in mylar). Krythe, Maymie. Sampler of American Songs. Background and Lore Connected with 18 of Our Most Famous and Beloved American Songs. New York. Harper & Row Pub. 1969. 245 pps. Octavo. Hardcover. First edition. Fine copy in dust jacket (rear panel repaired). Kuby, Herr Pfarrer Alfred Hans. 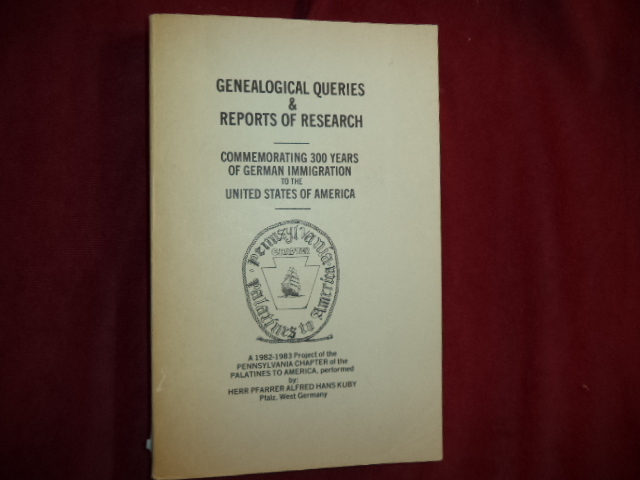 Genealogical Queries & Reports of Research. Commemorating 300 Years of German Immigration to the United States of America. Photo available. Mechanicsburg. Pennsylvania Chapter Palatines to America. 1983. Octavo. Soft cover. First edition. Fine copy. Kuecken, Jaohn A. 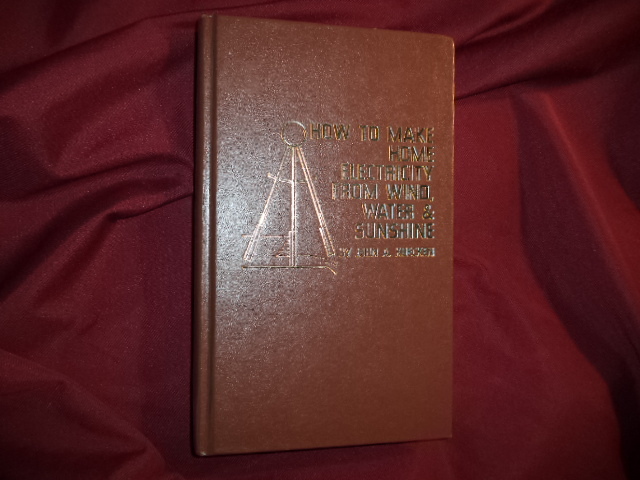 How to Make Home Electricity from Wind, Water & Sunshine. Photo available. Blue Ridge. TAB. 1979. Octavo. Gilt decorated hard cover. First edition. Illustrated. Fine copy. Kuhnhausen, Jerry. The Colt .45 Automatic. A Shop Manual. Photo available. McCall. VSP Boos and Videos. 1990. 202 pps. Octavo. Soft cover. Reprint. Illustrated. Important reference work. Fine copy. Kuklick, Bruce. Religious Advocacy and American History. Grand Rapids. William Eerdmans. 1997. Octavo. Soft cover. First edition. Fine copy. Kulzick, Alfie. Chatterbox. Biography of a Bar. San Francisco. 1986 - 1990. np. Self published. 2003. 4to. Soft cover. First edition. Illustrated. Important reference work. Fine copy. Kumar, Radha. The History of Doing. An Illustrated Account of Movements for Women's Rights and Feminism in India, 1800-1990. New Delhi. Aubaan. 2006. 4to. Soft cover. Reprint. Illustrated. Fine copy. Kump, Robert (compiler). Standage Family History Through the Years. Photo available. np. BYU - Idaho University Press. 2004. 229 pps. 4to. Gilt decorated hard cover. First edition. Illustrated. Important reference work. Fine copy. Kunciov, Robert (ed). Mr. Godey's Ladies. Being a Mosaic of Fashions & Fancies. New York. Bonanza. 1979. Octavo. Hard cover. Illustrated. Fine (owner name on end paper) copy in fine dust jacket (in mylar). Kunstler, James Howard. The Long Emergency. Surviving the Converging Catastrophes of the Twenty-First Century. New York. Atlantic Monthly. 2005. Octavo. Hardcover. First edition. Very good copy (underscoring) in fine dust jacket in mylar. Kuntz, K.M. Smoke. Cigars, Cigarettes, Pipes, and Other Combustibles. New York. Todtri. 1997. Octavo. Hard cover. First edition. Illustrated in black, white and color. Fine copy. Kunze, Michael. Highroad to the Stake. A Tale of Witchcraft. Chicago. University of Chicago Press. 1987. Octavo. Hard cover. First edition. Illustrated. Fine copy (owner blind stamp) in fine dust jacket (in mylar). Kuriscak, Steve. 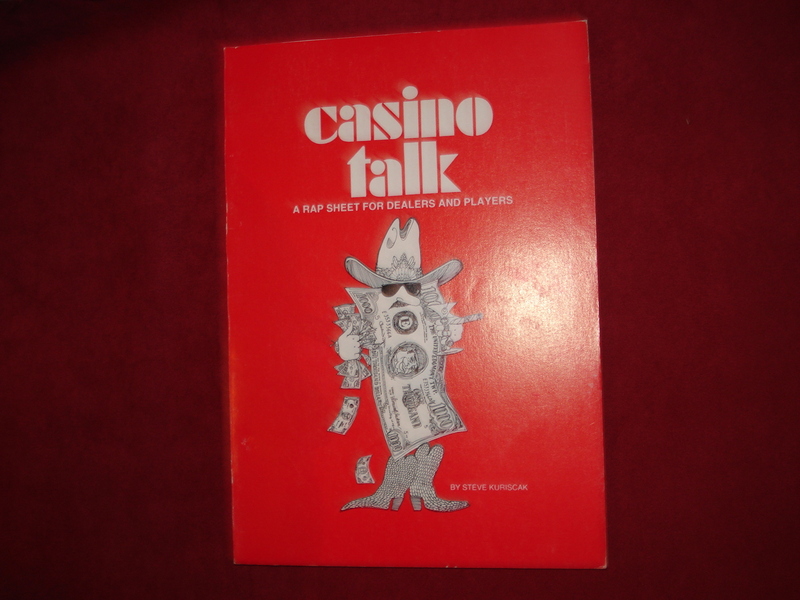 Casino Talk. A Rap Sheet for Dealers and Players. Inscribed by the author. Photo available. np. Self published. 1985. Octavo. Soft cover. First edition. Illustrated. Inscribed by the author. Fine copy. Kurland, Michael. A Gallery of Rogues. Portraits in True Crime. New York. Prentice Hall. 1994. 424 pps. Octavo. Hardcover. First edition. Illustrated. Fine copy in near fine dust jacket (in mylar). Kurland, Michael. A Gallery of Rogues. Portraits in True Crime. New York. Prentice-Hall. 1994. 424 pps. Octavo. Hardcover. First edition. Illustrated. Fine copy in near fine dust jacket (in mylar). Kurtz, Gary. Return to Oz. Escape from the Witch's Castle. Walt Disney. Racine. Golden Book. 1985. Octavo. Decorated hard cover. First edition thus. Illustrated in color and black & white. Very good copy. Light wear.